The art of stacking is at play with wishbone-inspired jewellery for personal style. High-quality metals stack vertically, one on top of the other, or sideways, creating chevron patterns and a stylish line-up. 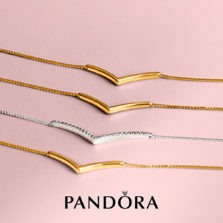 Welcome PANDORA Wish: The wishbone shape represents your ambitions or promises, as precious markers of your self-expression. Make a wish. Wear your wishes. Bring them alive. Clean. Simple. Stylish. Cool, calm and collected. Rings, charms, necklaces and bangles continue the wishbone’s inspiring design story with a narrative for the now and a fresh direction, presented in sterling silver and PANDORA Shine. The offer is valid 28.02.2019.